Lumen was bred from ‘Chil’, a working Aussie from America, and ‘Thor’, Rozate’s star herder and all-round good guy. Lu is serious, contemplative, and often paradoxical. 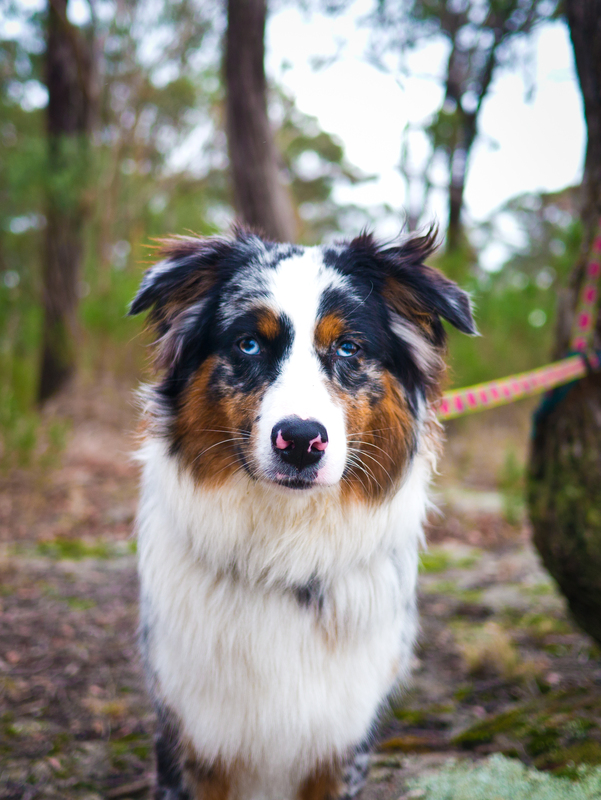 She has a high prey-drive and loves to hunt, meaning she spends most of our bushwalks on lead. Lumen delights in learning, tail wagging in slow and thoughtful way as she works out the puzzle. Speaking of which, we once bought an ‘advanced’ dog puzzle when she was about 3 months old, and she’d solved the ‘easy’ section within 6 seconds. Lu has been a huge journey in learning for me. She’s taught me so much about motivating dogs, about taking pressure off, about making agility fun and short and enjoyable, and we’re still learning. 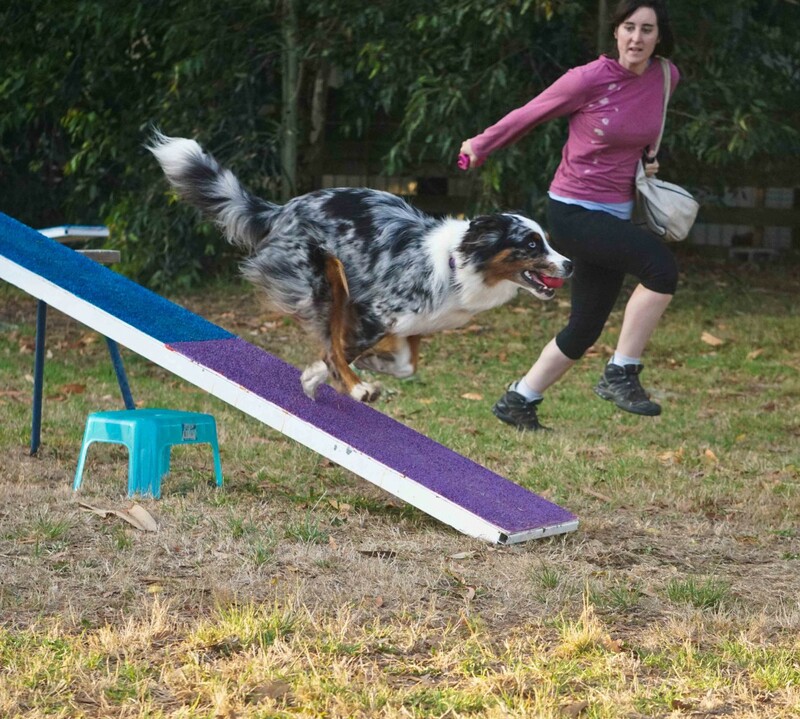 She was not born loving agility, and still doesn’t love the training – though she does love competitions – and so making things exciting for her is a challenge. Lumen has also had a couple of turns on sheep and has already shown a natural talent, ability to balance, and a calm steady work-ethic which is at odds with the frenzied lick-attacks we often receive while sitting on the couch. Lumen is hilarious with water- if she needs to drink from a creek, she’d rather walk all the way in up to her stomach than stand on the edge. One of her favourite games is to chase the water from the hose around the backyard. When it’s raining, unlike Mal, she strides forward on a walk, oblivious to the downpour, and walks through puddles rather than around them, and is absolutely fascinated by water pouring along the side of the road. Why is there a stream there when there was no stream there before!? And if I stand in it… woah! Sometimes if she’s inside and we take a shower, she comes in to visit us. Right in. The only deterrent is that the water sprays outwards and into her eyes, so she positions herself directly behind us, under the water so it can’t go in her eyes any more. One of our ‘jackpots’ during agility training is for her to hop in a bathtub full of water and chase the hose in there. Lu is one of the most challenging dogs I know. Life is very much Lumen’s way or the highway, and we are constantly trying to find a happy balance between me asking her/expecting her to do things and her actually doing them. My dog that had a brilliant recall developed a nasty habit of running off after wildlife, for which I am now paying the price on walks, and she is paying the price through restricted freedoms. Interestingly, at about 3 years old, she seemed to have finally matured and no longer needs to be constantly moving, checking, patrolling, investigating. She is still a very independent dog, constantly weighing up ‘what’s in it for her’ before she does anything I ask. Since taking Polona’s “Let’s Play!” class, her attitude to food has improved immensely. While she used to be vaguely interested in it, and think slowly and thoughtfully (as I wrote above) – she now chomps my fingers to get it, offers a million frenzied behaviours, and is much keener to work for it. This hasn’t fully translated to agility training yet but we’re making progress. Young Lu (6 months) & our first tunnel. This dog is also quite beautiful however not quite as easy to live with. A very lovely photo of a lovely dog. And then Lumen trundled up to me looking like this. I seem to have about 15 photos of our dogs poking their tongues out at me from this trip. And she can get some wicked height. (Mal’s all like: uh…. I don’t get it) I hope this photo gives you some pearspective on how high she can jump. Crouch down to obtain prey…!!!!!!!! One might say that’s a pearfect catch! She has fully demonstrated her expeartize at leaping and catching! How could you not feel tail envy over such a magnificent specimen? Dogs in unison part 2! Look at their cute little same legs. Ok, Lu, your jump here is a little overkill. Like… it’s smaller than that. Much. I don’t know if you’ll remember me, but we were friends on LiveJournal way back. Nosemovie? I had Razor and Ruben at the time. Ruben is not longer with us, over that rainbow bridge, but Razor is going STRONG and I got a new little blue merle Aussie puppy too! just like you, last year. Rumble turns a year today. Check out my Livejournal (yep, still there). if you’re interested. So glad Penny sent me this way to see what you’re up to. Your agility training looks GREAT! Can’t wait to see Lumen in the ring. I sure do remember you! Lucky every now and then I check the spam part of my comments cos yours showed up there! I’m heading over to have a look now- so great to hear that Razor is doing so well! So Rumble is a couple of months older than Lumen- I’m guessing you’ll be doing agility with him too? Ohh I just saw a picture- he’s gorgeous! 😀 And tails, too! And he loves water like my Lu, hahaha. They are very much alike our two tailed Aussies. I will keep up with your training because I do love the method and you’re doing an excellent job! Congrats on your wedding! You too look very happy. Rumble will be doing agility. He’s not quite as keen on it as Razor is yet, but he’s getting there! I got your invite to FB, but I don’t have an account. So we’ll just have to do it this way.